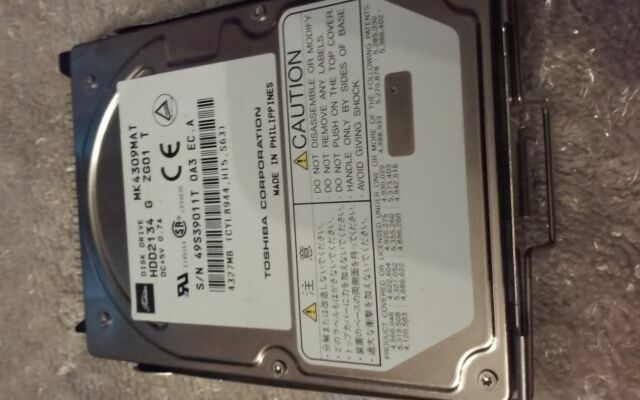 This Toshiba 4.3 GB hard drive is excellent for people who need to upgrade or replace a hard drive. It's equal parts dependable and speedy. This Toshiba 4.3 GB hard drive is the perfect option for storing critical data and applications. Small business owners and hardware enthusiasts are happy with the speed and performance of the Toshiba HDD2134. Featuring sturdy construction, this internal hard drive is wonderfully durable, allowing you to enjoy the benefits of long-lasting glitch-free uptime without fear of data errors or component failures. The Toshiba HDD2134 is very easily installed, so you can simply swap it into devices that support DMA/ATA-33 (Ultra) and ATA/ATAPI-4 standards. The blazing 4200 RPM rotation speed included with this internal hard drive makes it easy for you to copy massive applications, documents, and MP3s without the wait. The 512 KB data buffer featured on this Toshiba 4.3 GB hard drive enables you to achieve impressive system performance while watching videos, analyzing information, or backing up your system. What's more, the ample storage capacity included with the Toshiba HDD2134 makes it easy for you to hold onto all of your cherished digital camera pics, mp3s, and office applications with room to spare.